I found myself thinking a lot about endings this week. For a number of reasons. First, one of my favorite interview subjects from my days as a working journalist ended his longtime winning streak on July 4. Joey “Jaws” Chestnut, the eight-time Nathan’s hot dog-eating champion lost his crown this year. I interviewed Joey in 2009 when he was in Lincoln City for a rib-eating contest. He’s a very cool guy, and the story he inspired later won me a first-place writing award from the Oregon Newspaper Publishers Association. Considering I’m not a sports writer, and I loathe eating contests, it says a lot about Joey as a subject. I’ve followed his career ever since, so to see him lose this year made me sad for him. But eight years is a great streak. Second, I spent the final night in my house in Lincoln City getting it ready before the renters move in. Just me, surrounded by memories but also the promise of new experiences. Third, this is the first month of 2015 where I’m not coordinating the release of a new Anniversary Day Saga novel, because the saga is now complete and available in its entirety. In the old days of publishing, this ending would have meant, well, an end, at least for me as the publisher. But not in today’s world of publishing. 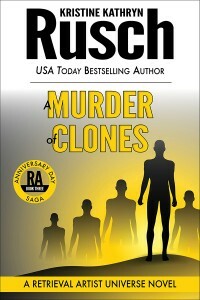 Case in point, we just received word of yet another outstanding review for A Murder of Clones, which we released in January. So now a whole new group of people are finding out about the amazing saga. You see, the end of the saga was really just the beginning of its new life. It now exists as a complete entity just waiting to be found by new readers—today, tomorrow and well into the future. So, really, while I’ve been thinking about endings, I’ve also been thinking about beginnings. The saying that when one door closes, another opens has a more poignant ring to it these days. That can translate in a whole lot of ways, but when it comes to the books we publish here, we find new doors opening all the time. Cover redesigns, new promotion tools, new formats: So many possibilities to breathe new life into our many wonderful stories. As someone very special told me recently, last times can be memorable. They can also herald the start of something even better. I can’t wait to see what the future holds. I hope you’ll join me on the journey.